Samsung Galaxy Tab 8.9 - The best tablet option? These prices make it the cheapest dual-core 3G capable tablet in the Philippines. Hardware wise, we also think it could the best, depending on your needs. 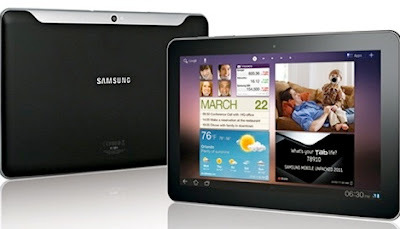 The Samsung Galaxy Tab 8.9 has the specifications of you basic Android 3.0 (Honeycomb) dual core tablet. It has a 800 x 1280 screen, a dual core 1GHz processor on a Tegra 2 chipset, 1GB of RAM, 16GB or 32GB (non-expandable storage), A-GPS, WiFi, 3G (HSDPA+ 21.1 mbps) and Bluetooth, connectivity and HDMI and USB connectivity through an adapter. It also comes with two camera's capable of 720p video recording. It also has full phone functionality. So it is the most fully feature tablet in the Philippine market. What is to like, hardware wise? The Samsung Galaxy Tab 8.9 has a smaller 8.9-inch screen compared to its competitors, but this also gives it a much lighter weight. We also like it best price wise for a 3G tablet. Smaller but still substantial screen, in exchange for the lighter weight seems to be worth it. It is 15% lighter than its bigger brother, the Samsung Galaxy Tab 10.1 and 25% lighter than the Apple iPad 2. Ultimately, 10-inch tablets are used on tables the same way we use netbooks and laptops. If used a tablet on a table, I really would much rather use a laptop. The Samsung Galaxy Tab 8.9 is a more mobile device. Something which is easier to use in hand than its larger 10.1-inch siblings. With Ice Cream Sandwich having been launched, more and more Android apps will be optimized for 720p screens. It could be the right time for an Android tablet. Would I buy it? Well no. I do not feel the need for 3G on a tablet. I already have it on my phone. Basically, I would rather not have to maintain a second line. Since I do not appreciate 3G, than things like Apple iPad 2 16GB WiFi only version is still a cheaper option at Php23,990. I also do not need full phone functionality on a tablet, so that score no points we me either. Second, I do not like being an early adopter. Ice Cream Sandwich has been launched so more and more Android apps will be optimized for 720p screens, but I will have to wait for those. Apple has 100,000 tablet optimized apps now, though they usually cost twice as much as iPhone apps. So it is a hard choice. The Samsung Galaxy Tab 8.9 is compelling hardware wise and there are more free apps on the Android Market. It is both a tablet and a phone is that is important for. But for a pure tablet, Apple iPad's are still the safer bet. For Php24.5K, I would not want to be an early adopter. Does Apple now think it invented the Apple? Is the Tablet the next Netbook? Is the iPhone 4S a dud? Apple iPhone 4S coming to Smart Communications?